Hello, I came across your excellent website whilst doing some work for a memorial we've been arranging and was suprised to see no mention of the above disaster on it. My Dad's uncle was killed along with 13 others and we have been working with the local authorities to get a permanent memorial stone in place where 12 of the bodies are buried. We have managed to do this and a dedication ceremony is taking place on 1st September 2009 at 1.30pm in Bilsthorpe, Notts. If you would like to come along, please feel free, I can send you more details if required. This was a sinking accident and the site of the new shaft was about seven and a half miles due east of Mansfield. Two shafts of 20 feet 2 inches diameter were being sunk within a lining and the work was started in July 1925. The coal had not been reached at the time of the disaster. The arrangements at both shafts was the same and on the 1st March the No.1 shaft had reached 278 yards, 20 yards deeper than the No.2, and was lined with concrete to 253 yards. Below this lining the side of the shaft was supported by 1 inch iron rings about 4 feet apart with backing sheets of corrugated iron behind held tight by wedges. The lowest ring was about five feet from the bottom of the shaft. Water had been encountered at 63 feet and below this point cement was injected into the surrounding strata to keep out as much water as possible. As sinking proceeded the shaft was lined with concrete 16 inches thick at the top gradually increasing to 25 inches at the last length that was completed. A steam pump dealt with water to a depth of 150 feet and then that was replaced by a Sulzer electrically driven centrifugal pump which was designed to deliver 1,000 gallons per minute against ahead of 1,040 feet. This was driven by a three phase motor developing 500 h.p. The combined motor and pump weighed 14 tons and was suspended in the shaft by a steel rope fixed at one end of the headgear, passed down the shaft and under a pulley on the pump unit and from there back up to the drum of a capstan engine by which the whole was raised or lowered as required. The electrical cable which supplied power to the pump passed through another hole at one side of each pipe clamp and was held there by special clamps. At the time of the accident the total weight of the pump unit, rising main full of water, clamps, cables and suspension ropes was 40.29 tons. The suspension rope was 7 inches circumference and was made of the best acid grade steel wire with a breaking strain of 161 tons. The walling scaffold was suspended on two other ropes attached to separate capstan drums which were 79 feet above the shaft bottom at the time of the accident. At about 7 p.m. on the 28th February a round of sumping shots had been fired and so far as could be judged they had done their work. From then on the work was to fill out the ground broken by the shots and the pump which had been raised the usual 18 to 20 feet out of the way while the shots were fired; it was lowered back into it’s normal position. The amount of water to be dealt with at the time was about 12 - 15,000 gallons per hour. The pump was lowered a few inches at a time as the debris was cleared from the bottom and the last time it was lowered before the accident was at 1.30 a.m on the 1st. March. There were 21 men working in the shaft and at about 2 a.m. they began to go to the surface in relays for their snap. When the third batch of men including the pump attendant left the shaft bottom everything seemed to be in good order but before they reached the top the pump ‘jacked’ (began to draw air) and on the signal from the bottom the current was cut off at the surface. On arriving at the top the pumpman decided to go back to restart the pump and went down in the hoppit with men who had finished their snap. The hoppit had been lowered to the ‘steady’’ a point about 18 feet from the bottom when it stopped until a further signal was given before it was lowered right to the bottom. At this point the men at the surface heard a crash and the greater part of the rising main, from the surface to about 169 yards down the shaft, collapsed into the bottom of the sinking pit. At the same time the electric cable drum was jerked from its foundation and pulled over towards the shaft, the cable itself being damaged about 150 to 160 yards down the shaft but it was not broken. The pump suspension rope was not damaged. The engineman felt a jerk on the winding rope and tried to raise the hoppit but found it was held down by the debris. Since the hoppit was trapped at the bottom of the shaft, the winding rope was cut at the surface, recapped and a new hoppit fitted. This was lowered down the shaft until it came to the lower part of the rising main which was found to be standing but was leaning across the shaft and prevented the hoppit making any progress. Shouts could be heard from the shaft bottom and another rope was lowered from the hoppit with a safety belt on the end. 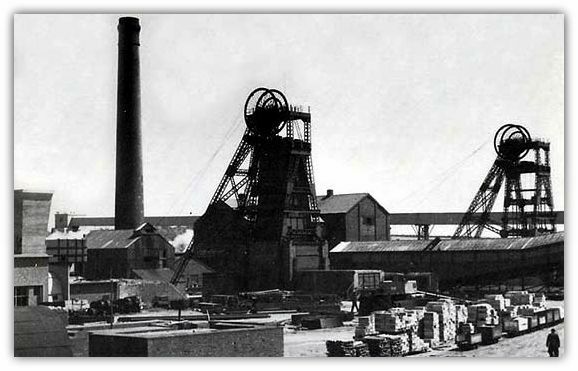 Three men were still alive at the pit bottom, Frederick Williams, George Edward Chappell and John Smith. Williams was on the pump ladder when the accident happened and was struck by falling material but managed to hold on to the ladder and eventually took shelter behind the pump. The two others were in the hoppit. After debris had stopped falling Williams got to the hoppit, which was at the side of the pump, and he found that Chappell and Smith were alone but injured. Chappell was able, with assistance, to get up the ladder to the walling scaffold but Smith could not move and to prevent him falling into the shaft bottom which was filling with water, Williams got him to the pump landing and tied him with a muffler and a handkerchief to the pump. During the hours that passed before they could be rescued, Williams went up and down the ladder shouting for help from the top and calming Smith. When the safety belt came down Chappell put it round Smith and guided him through the scaffold to safety. Smith was terrified and reluctant to make the journey. Shortly afterwards two more ropes were lowered and Williams and Chappell were both drawn to the top and safety. Chappell and Williams deserved the highest commendation for their courage and presence of mind during the eight hours it took to get the three out of the pit. Williams had examined the men in the hoppit and found that they were dead and a careful inspection of the shaft was made by Mr. Todd, the Agent, Mr. Linley, the Manager, Mr. J.R. Felton and Mr. W.E.T. Hartley, both H.M. Inspectors of Mines. Mr. A. Gee, the contractor and Mr. J.T. Brown, master sinker. The lower part of the rising main was dismantled and this work was complete at 3 a.m. on 2nd March when the walling scaffold was reached and the body of John Robinson recovered. Access to the other bodies was delayed by the rising water in the bottom of the shaft and the necessity to replace the rings and backing sheets which had been knocked out.